A while back (well, about 2 months ago) I decided to revisit my Jinhao X750 fountain pen. As a quick reminder, Jinhao is a Chinese fountain pen brand and can be found cheaply on eBay. My own pen sports a broad nib, which seems to be quite rare on the X750. Nostalgia dictated that I give this pen another try, even though it didn't score perfectly in my original review. So I loaded it up with Noodler's Heart of Darkness and gave it a whirl. Without further ado, here's what I like and dislike about it, bearing in mind that these points may or may not be true for different-sized nibs. Price. Back at the time I paid $8, shipped, but recently (after buying 3 more Chinese pens for very little) I realized that I could have gotten it for even less. Heft and build. While close inspection will reveal a certain roughness to its construction, it feels very solid nonetheless. Being all-metal (most likely brass), it is heavy and feels indestructible. Styling. It's not the most handsome pen out there. In fact the X750 is a bit kitschy if you ask me, what with the unevenly stamped checkerboard pattern, but its quirkiness is partly what lends it its charm. Comes with an international-sized piston converter. Much more expensive pens still eschew a converter and it really makes me question why those companies can't be bothered to include one. Easy to disassemble. The nib and feed can be easily pulled out from the section using your fingers. Cleaning is, thus, a breeze. A little bit kitschy and a little bit gaudy. The nib is a hard nail. The ink dries quickly in it. It seems that the nib isn't sealed properly inside the cap, which causes the ink to dry and evaporate. As a result, the ink runs out quickly even if you leave it sitting on your desk. The ink drying issue amplifies the nib skipping. The clip is too stiff, basically not well designed at all. I don't find it attractive either. 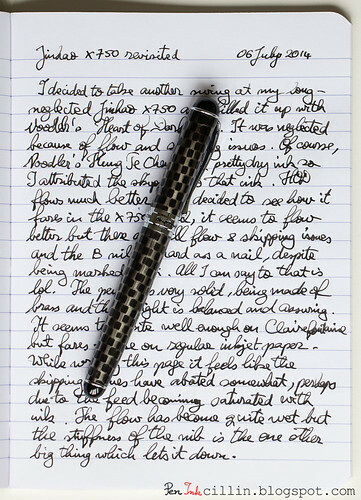 As you can see, there are plenty of things not to like about the Jinhao X750, with only a few positives. The balance might improve in favor of "likes" if a different nib were used. We shall see. I have acquired 2 other Jinhao pens (different models) with medium nibs and I'm curious to see if those perform better. For now, I would suggest to either stay away from the broad nib or to hunt for a really good deal on this pen, hopefully no more than $3 or so, if you can snipe it from eBay like I did for some of the other Chinese pens I bought. Agreed. I now have 4 of them. Remains to be seen what % is usable :) But I'm more optimistic about the medium nibs. It's a size 6 nib, isn't it? If I ever get my hands on a Goulet nib I might give it a shot. Unless I end up giving the pen away before then.